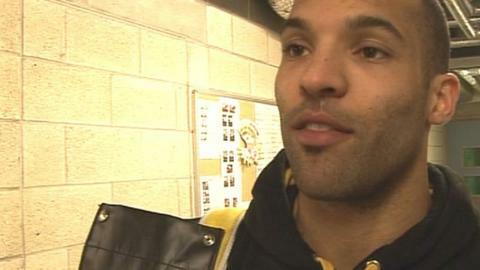 Captain David Clarke says it has been a "privilege" to play for the Nottingham Panthers for 10 years. The 32-year-old celebrates his testimonial season with a match between his all-stars and the current Panthers roster on Tuesday. Clarke said: "It's a privilege to play here. It's great to be part of the organisation and see it develop. "A lot of credit must go to the people behind the scenes and the fans, who've played a massive part in my career." The GB international first joined Panthers in 2003 from British National League side Guildford Flames. He won the Challenge Cup in his first season and led the Panthers to the play-off title in 2007 as captain. The Elite League's all-time leading goalscorer has won 10 trophies during his time in Nottingham and last year helped the club end a long wait for the league title. "Every year seems to get better for me here and the club," he added. "Last year was obviously a huge highlight as we got our hands on the league title after waiting so long. "We've worked so hard and the organisation has developed the team over the years. We have gone from strength to strength, year after year. "I am proud to be part of it and to have played a small part in it all too." A whole host of former players are returning for Tuesday's testimonial match at the National Ice Centre, including Barry Nieckar, Rastislav Rovnianek, Sean McAslan, Paul Moran, Mark Cadotte, Calle Carlsson and Ryan Shmyr. Clarke says he is humbled to see so many former players coming back and is keen to put on a show for the Panthers fans. "I am honoured," he said. "You play with these guys week in, week out. You grow really close but then guys go their separate ways. "But it's great to get so many people back on nights like this and celebrate a great evening. "The fans have played a massive part in my career here. They have been so supportive of me and my family. We wanted to make it an evening for them."